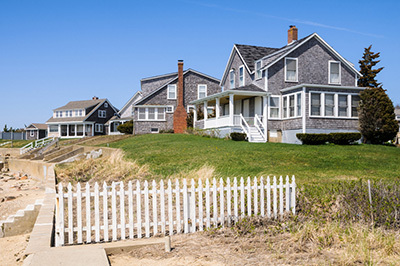 The summer rental market on Cape Cod has become very competitive. It is important that your home be ready to meet the needs of today's vacationer. We can provide you with information and design services to make your property a top rental retreat which will maximize your income. While it may seem easy to add your home to a large rental website and start booking on your own, there are many other aspects to the rental process that can make owners feel overwhelmed. We handle the booking process, accounting, and questions the renters may have. Our office has been renting properties on the Upper Cape for over 83 years. Each year, our large list of well qualified clients contact our office for summer rental properties. We pride ourselves on our white glove service and commitment to maintain relationships with great renters that will return year after year.... generation after generation. Here are a few reasons to consider choosing Francesca Parkinson, Ermine Lovell Real Estate, Inc.
· Friendly, professional, and supportive staff. · Vacation Rental Software which is updated to the minute with our website. · Agent evaluation includes a walk through of rental property, taking pictures, as well as give you a weekly rate based on market value of your property by one of our Rental Agents. · We prepare the vacation rental contract, make sure they are back on time with deposits, and constantly in contact with clients. · We handle exchange of keys for check-in and check-out. · We tailor your addendum on tenant leases. (Owner policies and procedures specific to the home). · Fast response to all email inquiries. · Emergency contact for tenants 24/7 during summer months. · Record Pre-bookings for your past guests for the next summer as they depart. · If you consider selling your home, we have a very experienced office of Sales Agents here to assist you. If you would like to speak with someone regarding sales, please let us know and we would be happy to refer you to one of them. If you are interested in a complimentary evaluation of your rental property with one of our experienced Rental Agents, call our office at 508-548-0703 or click here to submit your information, and a Rental Agent will contact you as soon as possible. Thank you!